“I am grateful for the extraordinary honour, bestowed upon me with the Fields Medal,” says Peter Scholze. The first German mathematician to be awarded the prize was Gerd Faltings in 1986, who is also a Director at the Max Planck Institute for Mathematics and a professor at the Hausdorff Centre for Mathematics. The Fields Medal is awarded every four years to recognize ‘outstanding mathematical achievement for existing work and for the promise of future achievement’. Recipients must be no more than 40 years of age. The other three fields medals of 2018 went to Caucher Birkar (Cambridge University), Alessio Figalli (ETH Zurich), and Akshay Venkatesh (Stanford University and IAS Princeton). These type of age limits have never been an issue for Peter Scholze: Right after his doctorate in 2012 at the age of 24 he became the youngest full professor at a German university, taking over one of the prestigious Hausdorff Chairs of the Hausdorff Centre at the University of Bonn. Even at this young age, he was considered one of the most brilliant mathematicians in his field. Now, at 30 years of age, Peter Scholze can already look back on an outstanding career and numerous awards, including the Leibniz Prize from the German Research Foundation. “I am delighted that we were able to attract Peter Scholze to the Max Planck Institute for Mathematics, and that together with the University of Bonn we have been able to keep him in Germany,” says Martin Stratmann, President of the Max Planck Society. With the Fields Medal, the International Mathematical Union acknowledges Peter Scholze’s groundbreaking contributions to arithmetic geometry. Number theory and geometry come together in this field of mathematics, which means that the properties of integral numbers are explored using geometric methods. In the past, this approach has allowed for century old problems – such as Fermat’s Last Theorem – to be proven, which could not be solved with purely number theoretic methods. The field also provides for the basic principles of many modern encryption methods. The objective of number theory is to answer questions about integral numbers, for example whether there is an infinite number of twin primes such as 3 and 5, 5 and 7, 11 and 13, etc. Or the question, how prime numbers are distributed along the number line. Geometry is dedicated to studying such objects as knots, planes, or higher-dimensional spaces. One important issue is the question, when two geometrical shapes are equivalent, that is when their essential geometric properties are the same. Mathematicians develop procedures for finding out, for example, whether two knots that initially appear to be different may still have been formed based on the same knotting rule. In arithmetic geometry, numbers are themselves understood as points in larger geometric spaces. Peter Scholze has discovered a new class of geometric structures, known as perfectoid spaces. These spaces are very large and complex, but they possess geometric properties that are useful for many problems. Several old and difficult problems of number theory could now be solved, with the help of perfectoid spaces. “The award and Peter Scholze’s personal success are of great importance, also for the University of Bonn,” says Michael Hoch, Rector of the University of Bonn. 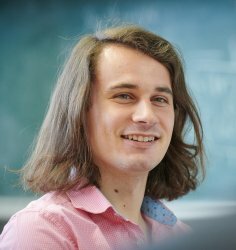 “He will, without a doubt, continue to contribute greatly to shaping mathematical research in the future.” Peter Scholze is going to continue his research in Bonn: “The working conditions here in Bonn are excellent, and the international atmosphere is very inspiring,” says the researcher. In addition to his chair at the University’s Hausdorff Centre for Mathematics, he has only recently become Director of the Max Planck Institute for Mathematics. “The Max-Planck-Gesellschaft strives to provide the best resources available to support his research,” says Martin Stratmann. This means that Peter Scholze is able to fully devote himself to his next breakthroughs in mathematics. A press conference with Peter Scholze is held at the Hausdorff Centre for Mathematics on Endenicher Allee 60 in Bonn, at 10:00 a.m. on Tuesday, 7 August 2018. The Max Planck Institute for Mathematics in Bonn is one of 82 research institutes of the Max Planck Society. The Institute was founded in 1980, and has soon become one of the world’s most prestigious research institutes for mathematics. It is managed by Directors Don Zagier, Gerd Faltings, Werner Ballmann, Peter Teichner and the newest addition to the Board of Directors, Peter Scholze. With only a small number of permanent research and administrative staff, the Institute’s guest program attracts over 400 research mathematicians from around the globe every year. The Institute is home to around 100 long-term guest researchers at all times. Research at the Institute covers most areas of pure mathematics. The Max Planck Institute for Mathematics is one of the six Institutes of the Hausdorff Center of Mathematics.